This procedure creates a virtual disk where you will install the OS. It uses Manual Configuration to create a virtual drive using only one hard drive. Log into the Oracle ILOM using the IP address of the service processor (SP) module. If you are using a Windows Remote installation, switch the mouse mode to Relative:, select KVMS —> Mouse Mode —> Relative —> then select Save. Select Relative from the Mouse Mode drop-down menu. Reboot your system and wait for the LSI banner. When the devices appear in the banner page, use the Control-H key combination. In the Adapter Selection screen, click Start. The MegaRaid BIOS Config Utility Virtual Configuration screen appears. 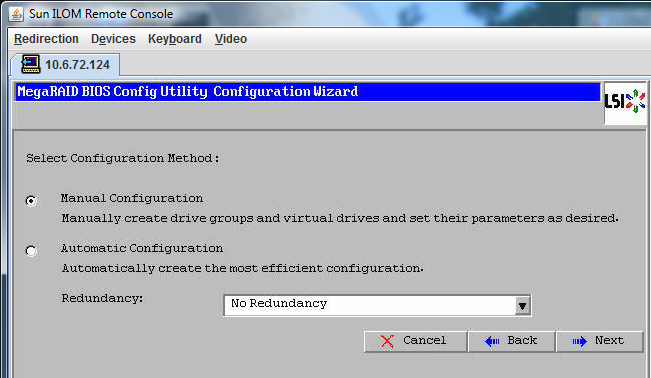 In the MegaRaid BIOS Config Utility Virtual Configuration screen, select Configuration Wizard. 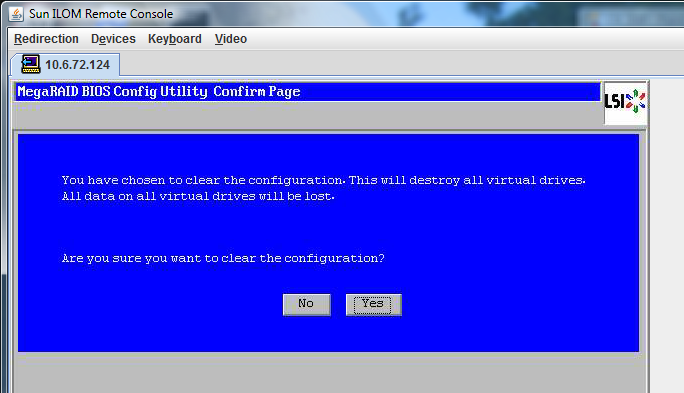 The MegaRaid BIOS Config Utility Virtual Configuration Wizard screen appears. 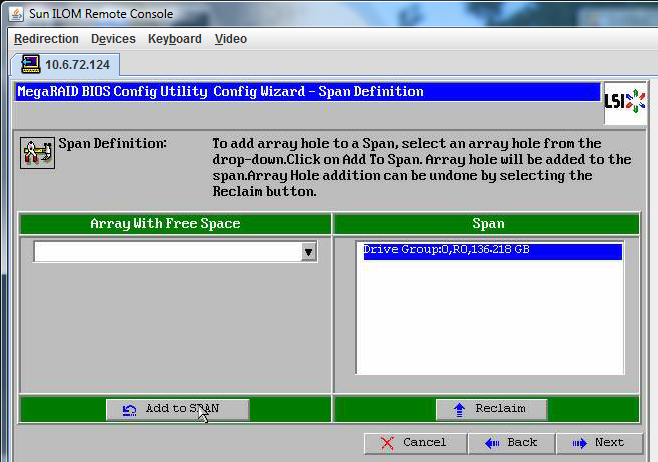 Click Configuration Wizard to start the virtual disk configuration wizard. Select New Configuration, and click Next. The Select Configuration window appears. Automatic Configuration creates a single virtual drive that combines all the hard drives on your system into a single virtual drive with all data striped across all the drives. The rest of this procedure uses Manual Configuration to create a virtual drive using only one hard drive. This is only one of many RAID options. To configure different RAID options, refer to SGX-SAS6-R-REM-Z: Software User's Guide available at http://www.lsi.com/sep/Pages/oracle/sg_x_sas6-r-rem-z.aspx. If a confirmation window appears, click Yes. The MegaRAID BIOS Config Utility Config Wizard – Drive Group Definition screen appears, showing the drives in the system and the drive groups. Select a disk drive to add to an array, and click Add To Array button. Click Accept DG to create the drive group. You can now view Drive Group 0. Note - You can undo the drive group selection by clicking the Reclaim button. The drive group appears in the Span Definition window. The drive group appears in the span. The Virtual Drive Definition screen appears. 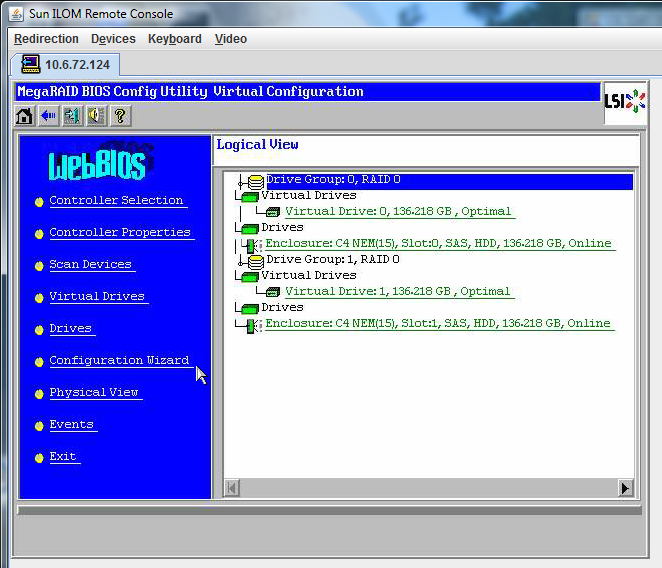 Set the RAID level and configurations you want for your virtual drive, and click Accept. For more information about configuring RAID, refer to your server's disk management documentation. The system prompts you to confirm Write Back with BBU mode. 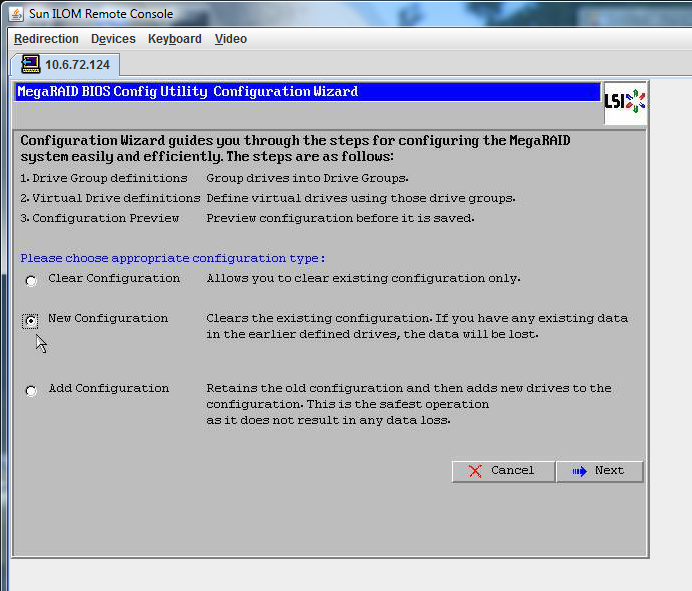 The Config Wizard— Virtual Drive Definition window appears. Verify that the virtual drive includes Drive Group 0. 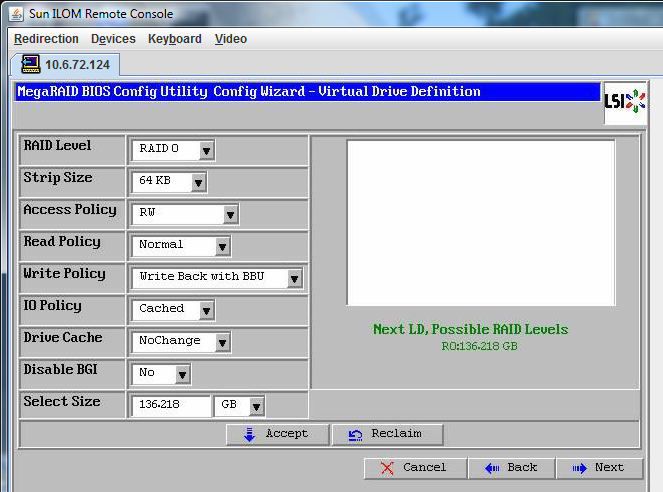 The example graphic shows a single virtual drive using the Manual Configuration option, then click Accept. Click Yes to save the Configuration. The prompt appears: All data on Virtual Drives will be lost. Want to Initialize? The Virtual Drives list appears.